OS X 10.7 and newer includes a new feature called the Recovery Partition. This is a normally invisible part of the Mac’s hard drive. The Mac can start up from the Recovery Partition, and it can be used to securely erase the primary hard drive partition, named Macintosh HD, where all of your data resides. If your Mac has OS X 10.7 or newer and a solid state drive, also called flash storage, then you should instead use these instructions to securely erase your SSD drive. If your Mac is running OS X 10.6 or older, use this 2010 Tech Tip which has instructions on How to Securely Erase A Mac’s Hard Drive. Here are the steps to securely erase your spinning hard drive on OS X 10.7 (Lion) through OS X 10.10 (Yosemite). If you have OS X 10.11 (El Capitan) or newer then check out this article (Tim or Jim add link). Turn on the laptop and immediately press and hold down both the Command key and the R key. This instructs the computer to startup from the Recovery Partition. Once you see the Apple logo appear in the middle of the screen you can release the Command and R keys. Give your Mac a couple of minutes to startup, at which point you’ll see a window like the one this one. 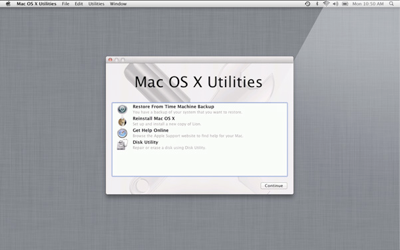 Click on the Disk Utility option from the “Mac OS X Utilities” window. In the left pane of the Disk Utility window, click on Macintosh HD (which is your laptop’s internal hard drive). You’ll be asked if you’re sure you want to erase it. You’re sure. Go ahead and click the Erase button. Read more about 10.7, flash storage, hard drive, mac, OS X, recovery partition, securely erase, SSD.